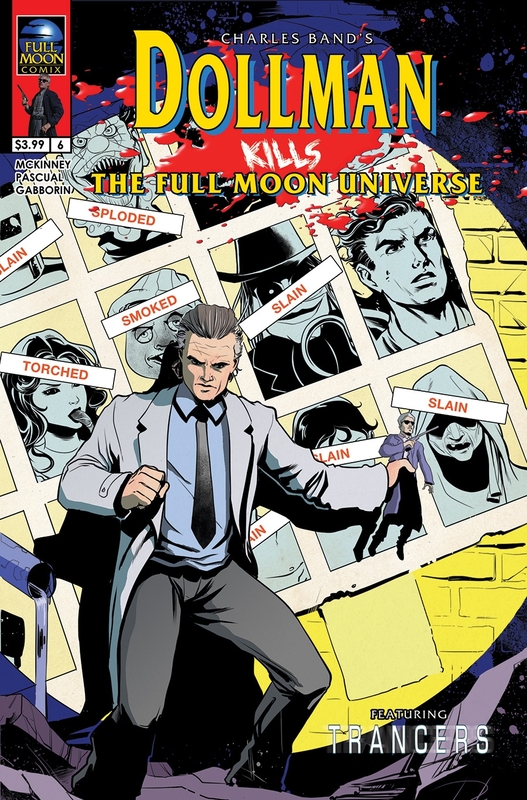 Full Moon Comix's acclaimed flagship series DOLLMAN KILLS THE FULL MOON UNIVERSE reaches its thrilling conclusion in the 6th and final issue, available NOW via Full Moon Direct and at cream-of-the-creepy-crop comic shops across the land! This time, Dollman's mission to massacre each and every character from the Full Moon Universe goes meta as the miniature interplanetary supercop faces off again TRANCERS' main man, time-travelling zombie hunter Jack Deth! The inimitable Tim Thomerson played BOTH characters in their respective franchises, making this a clash of the titans in more ways than one! It’s the ultimate final showdown as Dollman prepares to wipe the universe’s slate clean by taking on Full Moon’s biggest badass,Trancer’s star, Jack Deth! It’s a Full Moon first, with Thomerson versus Thomerson, and the fate of the entire galaxy hangs in the balance! This is the series finale that launches the NEW Full Moon Comix Universe!